5.11 Tactical's CAVU Full Frame Standard Lens Sunglasses offer a bold and aggressive new styling in a full frame, standard smoke lens. The TPR inserts on nosepiece and bayonet temples provide a secure fit and excellent peripheral vision while the lenses reduce distortion and exceed ANSI High Velocity Impact Safety & Optical Standards. 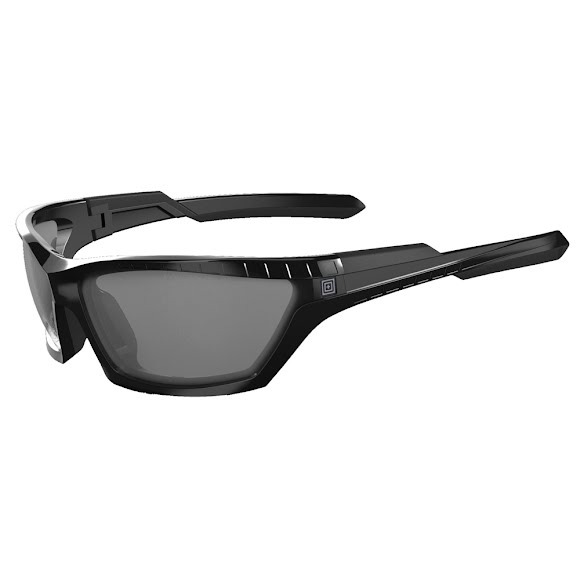 5.11 Tactical&apos;s CAVU Full Frame Standard Lens Sunglasses offer a bold and aggressive new styling in a full frame, standard smoke lens. The TPR inserts on nosepiece and bayonet temples provide a secure fit and excellent peripheral vision while the lenses reduce distortion and exceed ANSI High Velocity Impact Safety & Optical Standards. Smoke lenses provide maximum glare reduction, won&apos;t distort colors, and are excellent in bright/glare conditions. T-Shell coating means resistance to scratching, cracking, and crazing. Selenite polycarbonate is die-cut to produce lenses without distortion from any angle and is ten times more impact resistance than glass or resin lenses. Frames are built with Grilamid TR-90, a homopolyamide nylon characterized by an extremely high alternative bending strength, low density, and high resistance to chemical and UV damage. They are virtually indestructible.